It is a typical fish which lives in a coral reef. 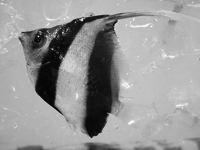 Contrast of monochrome yellow is the feature of this fish. The dorsal fin extends long backward.